SMS Towage celebrates the Englishman that rose from the harbour to start a long tugboat line. The remarkable story of the Englishman tugboat family is into its 10th chapter. The tale has so far spanned 127 years of misadventure at sea, the courage of crews in peace and wartime and the workaday rhythms of UK ports. Especially those on the Humber, where various tugs called Englishman have provided vital services dealing with boats of all sizes on the north and south banks of Britain’s biggest trading estuary, as well as embarking on seagoing towage and salvage work. Hull-based SMS Towage, which since the millennium has grown into the UK’s largest privately owned tugboat company, named the 10th Englishman earlier this year after buying her from the Sanmar shipyard near Istanbul. With a 50-ton bollard pull (a key measurement of a boat’s power), she can bring in and take out 270m-long long ships of more than 170,000 tonnes dead weight, such as the large tankers and bulk carriers that regularly dock at Immingham jetties. Designed by famous naval architects Robert Allan Ltd of Vancouver, she is capable of 13 knots and is among the most manoeuvrable vessels on the estuary. It’s a tradition in the industry to run with family names and the Englishman lineage outlasts all. So where did the story begin and what became of the first Englishman, like all her successors a real workhorse of the maritime industry? Despite sinking in Seaham Harbour, Co Durham, in 1894 only five years after being delivered she became the longest lasting Englishman so far. Showing how tugboat design has evolved into today’s compact and powerful boats, she was 10m longer than the current bearer of the name and generated 580 brake horsepower from her steam-powered engines compared with 3,500bhp from today’s normally diesel-powered vessels. Three well-known Hull business names were behind the Englishman: Cook, Welton and Gemmell built the vessel, Charles D Holmes made the engine and T Gray and Son owned her. According to WJ Harvey and D Asprey, in their history of the United Towing Group and North British Maritime Group, the Englishman collided with and sank the British steamship ADA eight nautical miles offshore, but made it back to harbour before going down herself. She was raised and returned to service. New owners in France renamed her the Industrie and sold her to a Swedish firm for £4,500 (compared with the modern Englishman’s £3.5m price tag). Sailing under the Swedish flag in China, she was seized by the Imperial Japanese Navy during the brief war with Russia in the 1900s (the one in which Russian ships mistakenly fired on the Hull fishing fleet on Dogger Bank). Finally, called the Itahashi, she was probably broken up in mid-1930s. Paul, who cut his teeth in the industry with United Towing, established Specialist Marine Services in 1992 after a decision to cease deep-sea towage. The new business became well known for moving oil and gas rigs and a decade later the firm started harbour towage under the name SMS Towage after seeing the business opportunity on the Humber. Seagoing work remained an important part of the business, none more so than when Englishman No9’s first assignment, after being built in China in 2006, was the company’s longest ocean towage operation to date when bringing two tugs from Java to Hull. Storms and even the threat of piracy made this slow boat from China an exceptionally testing voyage. The new boats, renamed the Yeoman and Irishman, were part of the rapid development of the SMS fleet, which now also operates in the Bristol Channel and Belfast Harbour with other ‘man’-suffixed boats, including the Yorkshireman, Welshman, Scotsman and Trueman. After working on the Humber, the ninth Englishman was old in 2015 to Portland Harbour Authority on the south coast, and renamed Rufus Castle. The Englishman predecessors all have a story to tell although some have gone off the radar, such as No.2, built in 1904, sold to Greece in 1912 and deleted from Lloyd’s Register in the mid-20s without explanation. The power that is at the heart of any tug allowed Englishman No3 to escape a North Sea submarine attack in 1918. The ship’s last UK owner, United Towing, sold her for £2,000 in 1932 to the Nawab of Cambay. The 18 crew members on the 135ft Englishman No4, built for United Towing in 1937, lost their lives after the Admiralty requisitioned her for war service. On January 22, 1941, she signalled she was under attack from German aircraft off the Northern Irish coast, but nothing more was heard of her crew. In the 1980s wreckage was found, including her bell, six miles off the Mull of Kintyre. The government used her design as a template for a series of Empire tugs. One of these was purchased by United Towing and renamed the fifth Englishman. She was sold again after 15 years on the Humber to a Portuguese company and then to Greece. HMS Reward, which had sailed as the sixth Englishman for just seven months under charter to United Towing, collided with a container ship in the Firth of Forth in 1976. She was salvaged and sold for demolition. The Cochrane’s yard at Selby launched Englishman No7 for United Towing in the mid-1960s as the most powerful ocean tug in the UK. She operated worldwide, including salvage operations when posted off Cape Town, before being requisitioned to protect UK trawlers during the Cod Wars when live rounds were fired at her. She was sold on and, finally, sailing out off Gravesend as the Towing Witch, was declared a total loss because of severe engine room fire damage on a trans-Atlantic tow. 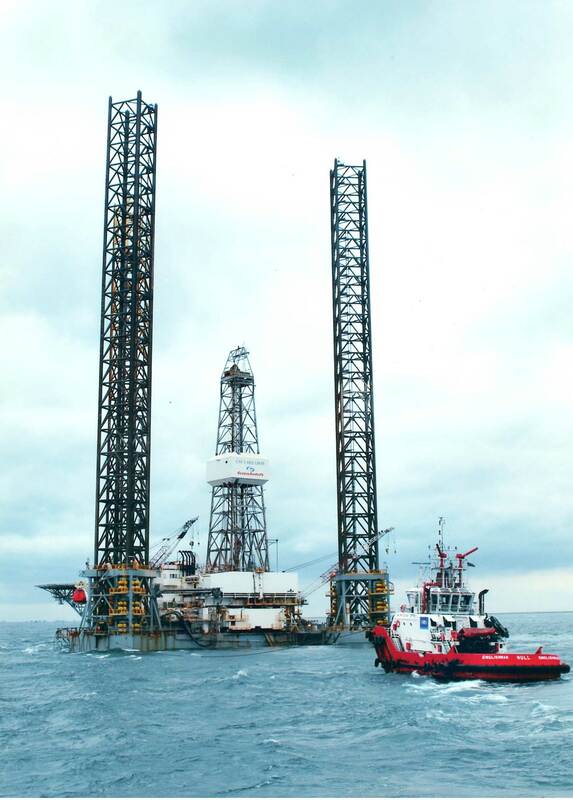 No8 was another world traveller, the Schepleturm, built by OSA in Germany in 1975 and one of the most powerful offshore vessels with 10,000bhp and a bollard full of 120 tons. SMS was instrumental in the sale of the vessel and awarded management of her. “During this period, we secured many notable charters including two of six months to the UK government,” says Paul Escreet. “The boat was stationed in the Shetlands working as an emergency towing vessel for the Maritime and Coast guard Agency. The present Englishman, No10, is unlikely to be the end of the line. SMS managing director director Patrick Lyon says there is ‘massive room’ on the Humber for further investment and SMS Towage can roll out it business model to any port that needs reliable towage services.